Happy Birthday to PR LEADS! Home/Publicity, Publicity thought leadership/Happy Birthday to PR LEADS! August marks the beginning of the 14th year since I started helping authors, speakers, coaches, consultants and small business people with our PR LEADS service. I’m happy to report that our clients have told me of great successes and they’ve rewarded me by being loyal customers for many, many years. We recently conducted a survey to find out what you wanted. The results were pretty uniform – and I’ve listened to you. You don’t want irreverent or irrelevant. You want ROI. So we’re changing the name of the newsletter to PR LEADS to Profits. Catchy, n’est pas? You also asked for more hands-on training and webinars. Look for new courses on the topics you asked for in September! That’s it for this week. 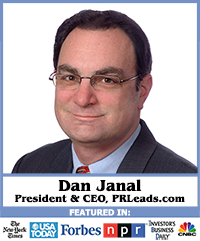 Look for great tips in next week’s PR LEADS to Profits newsletter! Remember, we help turn small companies into big names! That’s great news, Dan. Congrats on your success and sharing it with others.